I was in Seattle for a few days over the holidays and I happened through the EMP Museum. Boy is this a weird place. On the one hand, they have a really great guitar exhibit detailing the history of the guitar, and a great guitar sculpture, two stories high. In the guitar history exhibit, I also learned bunch of very interesting facts. For example, did you know that before Leo Fender introduced the Fender Precision bass, basses were upright and fretless, even when played in popular music? The name of the bass, “Precision”, came from the fact that he introduced frets to the bass, enabling many more people to pick up the instrument. It was also the first electrified bass. Leo Fender seems like a true innovator. He sold the first solid body electric guitar, the Fender Broadcaster, which was later renamed Telecaster, due to a name conflict with Gretsch, who owned the name “BroadKaster”. The Telecaster design, with the bolt on, single piece neck, and with a design enabling guitars to be put together from many parts, enabled mass production on a scale not yet seen in the guitar world. In this way, he was the Henry Ford of guitars. 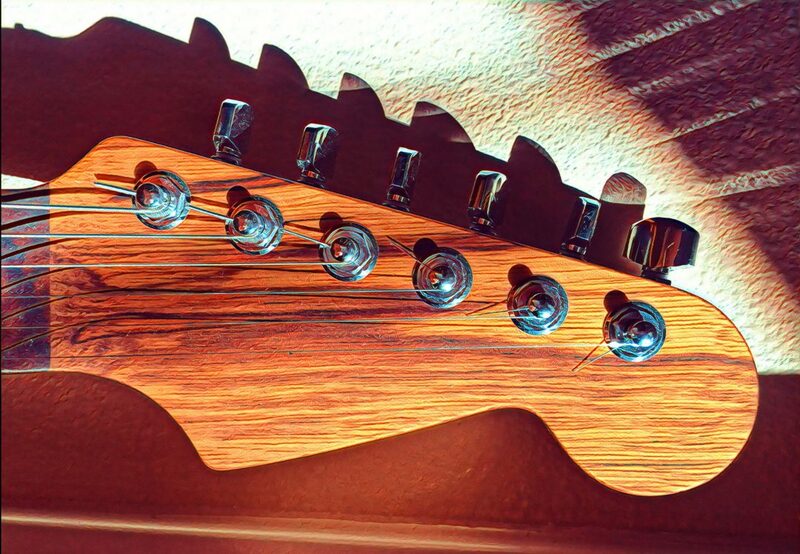 He followed that up with the Stratocaster, introducing many other novel design aspects: three pickups, deep double cutaways, and a spring tremolo. Leo Fender seems like he was a remarkable man and a true innovator. There are some significant guitars in the museum. Like this one, on which Jimi Hendrix played the national anthem at Woodstock. But back to the museum. It is also a very novel building, looking like a bunch of plastic CDs which have been sitting in the sun too long. But on the other hand, the EMP Museum is also weird. There are displays celebrating Hello Kitty and a big display celebrating science fiction and horror movies. Fun but odd, with nothing really connecting the exhibits except for the loose aspect of popular culture. If you are in Seattle, definitely worth checking out. Now back to hacking guitars.